Yassen Hasan Abdallah Omer, the finder of the serekh. A team of archaeologists led by Dr Joanne Rowland (Free University of Berlin), has located an Old Kingdom mastaba at Quesna. 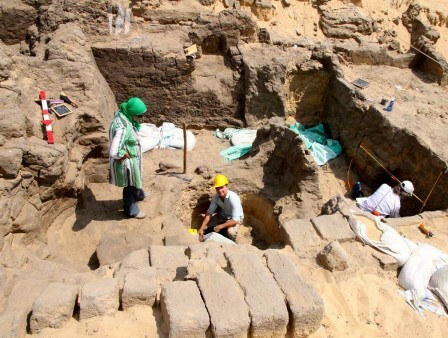 The site of Quesna situated on a large sand gezira in the Central Nile Delta was until recently best known for its Late Period to Roman remains. It is the location of a Late Period to Ptolemaic Mausoleum, as well as a contemporary sacred falcon necropolis, with an extensive Roman cemetery, some of the burials of which are dug into the walls of the mausoleum. 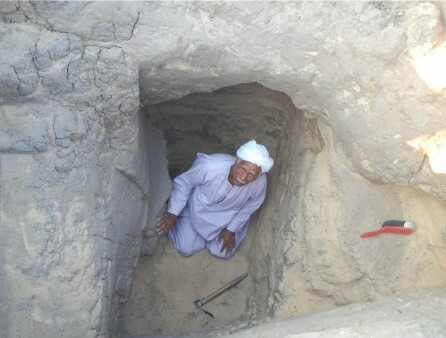 A team of archaeologists under the auspices of the Egypt Exploration Society, led by Dr Joanne Rowland has been conducting research and holding fieldschools at the site since 2006. The team has been conducting geophysical survey and examining the human remains in this vast cemetery (the gezira was once much larger, with burials being found up to 2 km from today’s central point). During these later periods the site seems to have been one of the burial grounds for the community living at Athribis, which is located 7 km to the southwest of Quesna. Although the tomb had been severely looted in antiquity, enough pottery and stone vessels remained to place the tomb between the end of the 3rd Dynasty and the beginning of the 4th Dynasty. Other objects found included hundreds of beads from the jewellery that once adorned the occupants of the tomb. Unfortunately none of the inscribed elements of the tomb had survived to inform the team as to the identity of the tomb-owner. 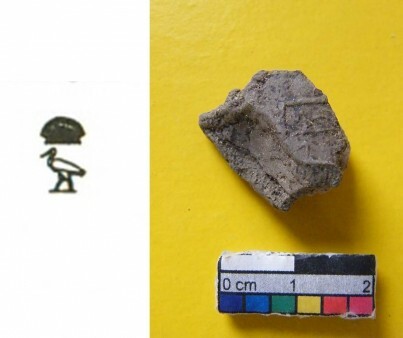 However, in the last few days of the excavation an extraordinary artefact was found in one of the two burial niches, a seal impression bearing the name of King Khaba within a serekh. This little known king of the 3rd Dynasty, who probably reigned for as little as six years is best known from the stone vessels with his serekh inscribed on them from mastaba Z500 at Zawiyet el-Aryan (ZeA). The unfinished Layer Pyramid at ZeA was probably built for this king, although no remains of his burial were found. This is the first tomb excavated in over 100 years that can be assigned to the reign of King Khaba with any certainty. Its placement in the central Delta raises several questions about the provincial administration of Egypt during the 3rd Dynasty, as well as the identity of the individuals that were buried in the Quesna mastaba. The team will continue their work next year and hope to answer some of these questions.